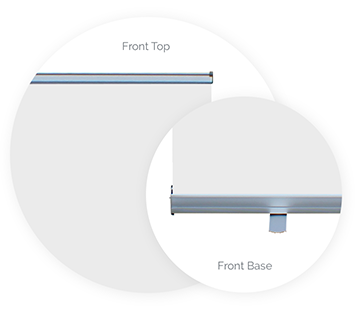 The Econoroll Banner Stand is a simple roll-up display system for printed vinyl banners. 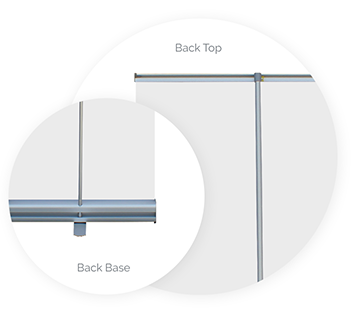 The lightweight aluminum casing provides a safe housing for your display banners when not in use and acts as a sturdy base for the banner when in use. The Econoroll Banner stand accommodates 24" wide banners, which are an ideal size for indoor use where using minimal floor space is a priority. A retractable balancing foot located under the base keeps your imagery stable while maintaining a small footprint. A collapsable "tent-pole" style support leg keeps the banner straight by connecting the base with the top of the banner with a plastic tongue. When purchasing the Econoroll Banner Stand from Printastic, the system arrives with your vinyl print media preinstalled, saving you time and effort. The unit comes in a gray & black zippered fabric bag with carry handle and shoulder strap for convenient portability. The Econoroll Banner Stand from Printastic is our most affordable banner display system for indoor use. Single sided banner is fastened with adhesive inside the base for long term use and incredible reliability. If your goal is deliver a steady message from a compact banner stand, look no further than the Econoroll system from Printastic!